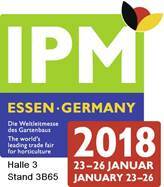 From 23 to 26 January 2018, the world’s leading horticultural fair IPM will be organized in Essen for the 36th time. Every year the IPM has more than 1,500 exhibitors and more than 57,000 visitors from all over the world. As in previous years, RVC Industrial Packaging will also be present on the IPM Essen. You can find us on stand no. 3B65.